Home / Sports / Schools Cricket / THE SCHOOLS ROUND UP FOR THE 2015 SEASON.. THE SCHOOLS ROUND UP FOR THE 2015 SEASON.. The end of the Schools season is here, and I have been away from writing for approximately 6 years as I was otherwise occupied with a full calendar that made it hard for me to write on a regular basis on rugby matters! Royal won the elite Singer league title after 4 years when they beat Isipathana by 21-8 at the blockbuster league final played at the Royal Stadium on June 12th. The score line does not indicate too much the dominance displayed by Royal which surprised a lot of people – three tries to one by Royal. Isipathana opened the account of tries when they scored on the right side off a terrible clearance kick made by Royal which resulted in a ruck 5 meters from the Royal line with the far side winger scoring the try! The scores were 16-8 at half time but Royal took the game away from Isipathana in the 2nd half with some brilliant game strategy that somewhat started in the 1st half but was cemented in the 2nd half. What better way to render the opposition helpless by using the best defensive tactic around in rugby of keeping the ball as much as you can. They killed the clock clinically, used their strengths, the rolling maul to great effectiveness, created 15-16 phases by taking short hits and also moved the ball on 2nd and 3rd phase when they were in the Isipathana 22’. Isipathana on the other hand did have their worse outing for the season and all credit of getting to this final as an unbeaten team should go to the coaching staff and the team, brilliantly led by Omalka Gunaratne. I believe they did not handle the Royal rolling maul well at all. From the video replays I watched of the 15 rolling mauls or thereabout that Royal unleashed maybe one of them could have been deemed as obstruction but the remaining mauls were fine! Infact, Isipathana is lucky not to get thrown in a few yellow cards and a penalty try for collapsing the maul which they had no answer for. I was told unofficially that the Royal #7, Shawket Lahir was the man of the match and I would tend to agree as he kept a dominant force in Omalka quiet the whole evening. Isipathana have their fair share to blame – at least a minimum two dropped passes which would have been tries (one by Omalka and one by Kushan Indunil) as the line was staring right at them. In the end Coach Martis and Lewke’s strategy outworked Coach Ibrahim and Walpola’s strategy and Royal dominated the win and were unfortunate not to score a few more points. There is a huge debate going around in the world about the rolling maul – whether it should be made illegal. The big discussion is the rolling maul – how does one counter this? For one, not engaging the opposition in the rolling maul would mean that the offensive team would need to ensure that the ball is kept in front with a player in the front. If the offensive team moves the ball to the back of the maul with the defensive team not engaging, this would be a penalty for obstruction or called “truck and trailer”. However, Internationally a lot of Super 15 teams are also opting to not engage the rolling maul, and if I may, I would equate that to “Greg Chappell ordering his brother Trevor to bowl underarm in the last ball against a Kiwi side that had to score 6 runs in the last ball of a test in 1981”. The question is “Whilst it is legal, is it sportsmanship”! There is a huge debate going around in the world about the rolling maul – whether it should be made illegal. There are premier clubs around the world and International Team Coaches both making their case to have it or not but in the end, until the IRB changes any laws, all teams will have to defend it. As mentioned in the above paragraph one method is to not engage and the other more traditional method would be for the defending side to commit everything to destroy the rolling maul in its first building blocks right at the beginning of its creation and when the rolling maul is most vulnerable. If this is not achieved, there is no stopping this human tank – specially from 10-15 meters from the defending goal line. The overall results of the teams were quite interesting. Defensively, Royal gave up the least amount of points, keeping it to a meager 121 points whilst the next best was Isipathana who gave away 140 points. It proves a point where defense wins matches and in the case of Royal and Isipathana keeping the ball for an average 62% & 57% of their games, ensures that offense is the best form of defense. Isipathana scored the most number of tries during the season by scoring 56 of them but only converting 36% of those tries. Royal on the other hand scored 45 tries and converted 49% of them. St. Josephs converted 67% of their tries (36/24) whilst Kingswood, the last on the table converted 60% of their tries (30/18). Trinity too converted 63% of the tries which augured well for their final push to be number three (46/29). Infact, it was the ability to score more tries than Science College that pushed them to the 3rd place as Science College managed 42 tries during the season. 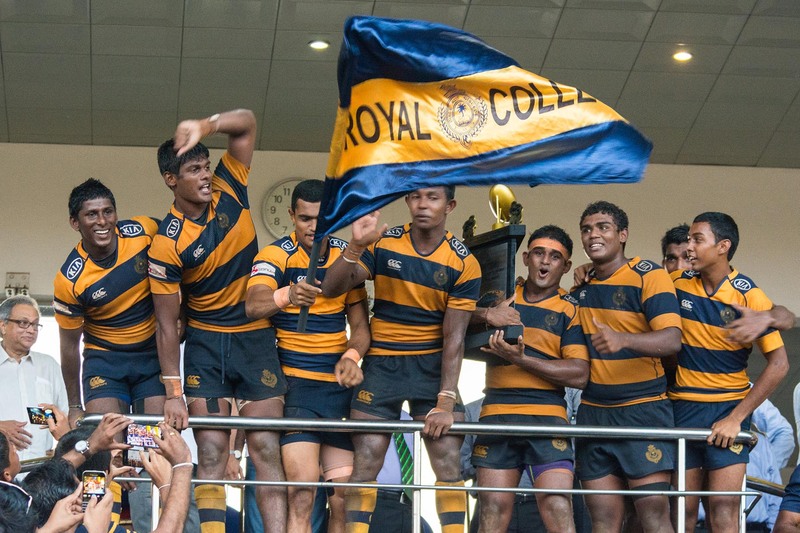 Royal (100%), Isipathana (89%), Trinity & Science (67%), and St. Josephs at (56%) were the only teams from the initial teams of 12 in the A Division to have a winning percentage of over 50%. Previous Education system given right Royal treatment..